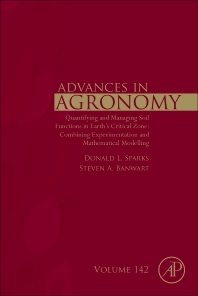 Quantifying and Managing Soil Functions in Earth’s Critical Zone: Combining Experimentation and Mathematical Modelling, Volume 142, the latest in the Advances in Agronomy series continues its reputation as a leading reference and first-rate source for the latest research in agronomy. Each volume contains an eclectic group of reviews by leading scientists throughout the world. Five volumes are published yearly, ensuring that the authors’ contributions are disseminated to the readership in a timely manner. As always, the subjects covered are varied and exemplary of the myriad of subject matter dealt with by this long-running serial.